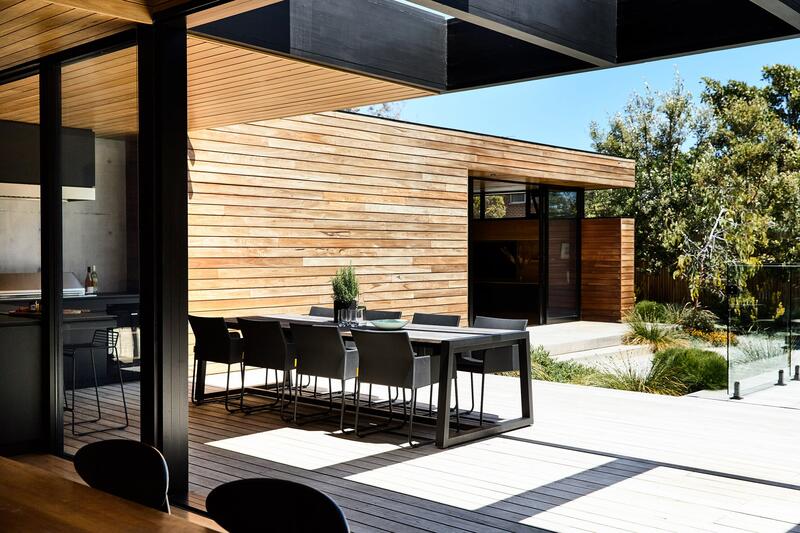 Munro Ocean Beach House is the 2017 winner of the Australian Timber Design Awards in both New Buildings and Rising Star categories. 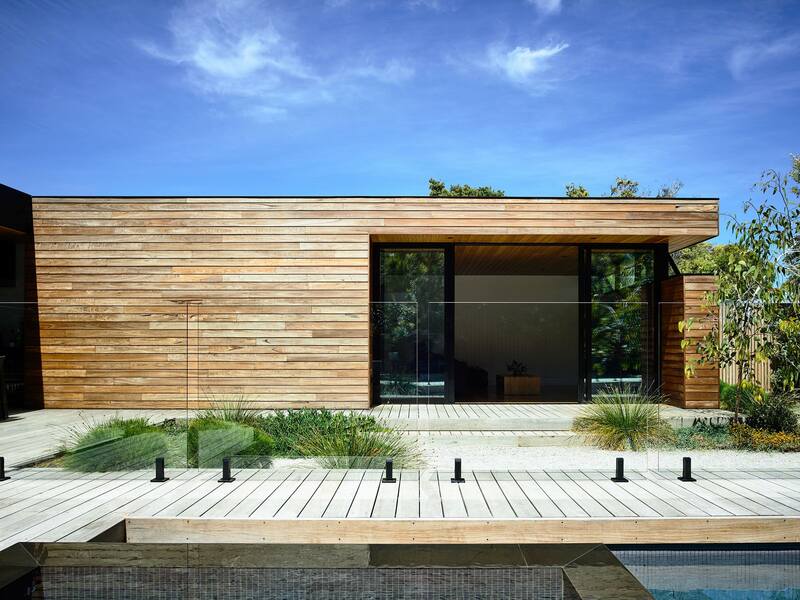 Sitting harmoniously amongst the tones of the local indigenous vegetation, this Mornington Peninsula property uses timber extensively. 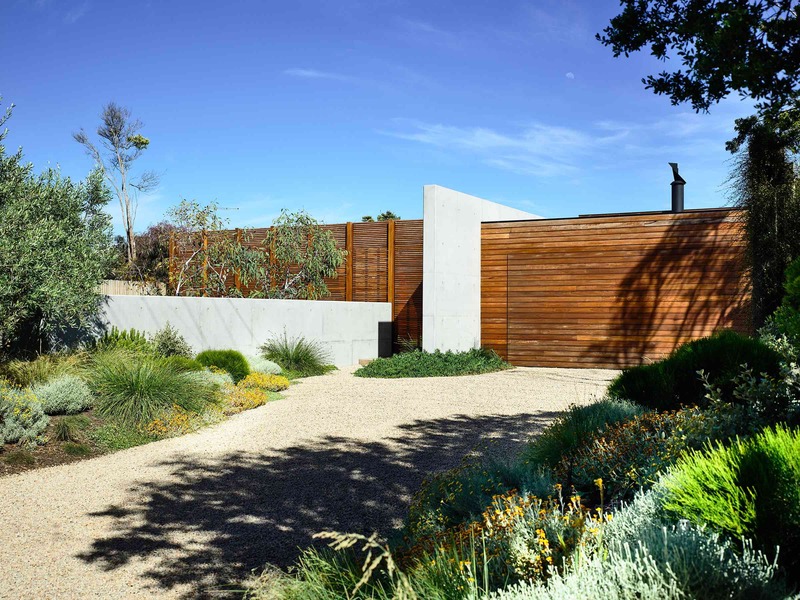 In the ocean beach environs of Blairgowrie on the Mornington Peninsula, this house presents itself as a robust, tactile and refined combination of timber and raw concrete. 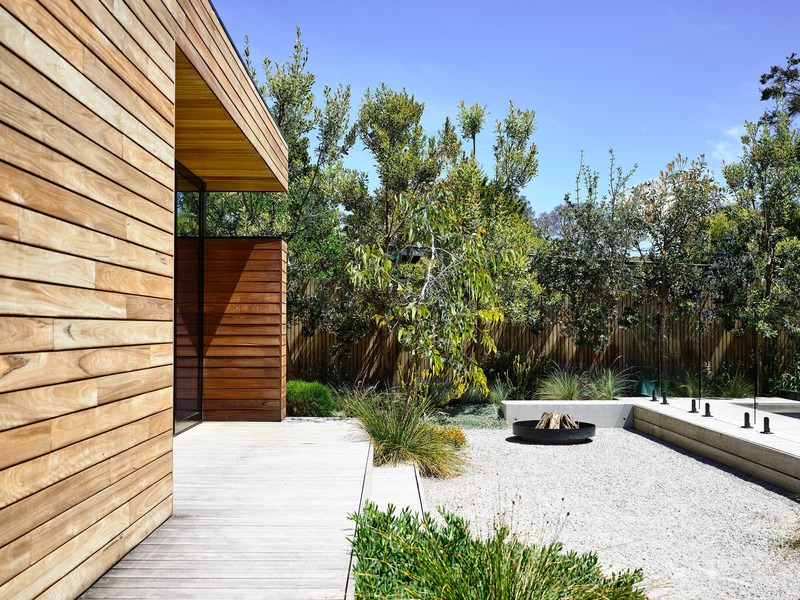 Its understated presence embraces the coastal streetscape through the extensive use of natural timber, sitting harmoniously amongst the tones of the local indigenous vegetation, whilst privacy is created through a thoughtful combination of solid walls and operable timber screens. 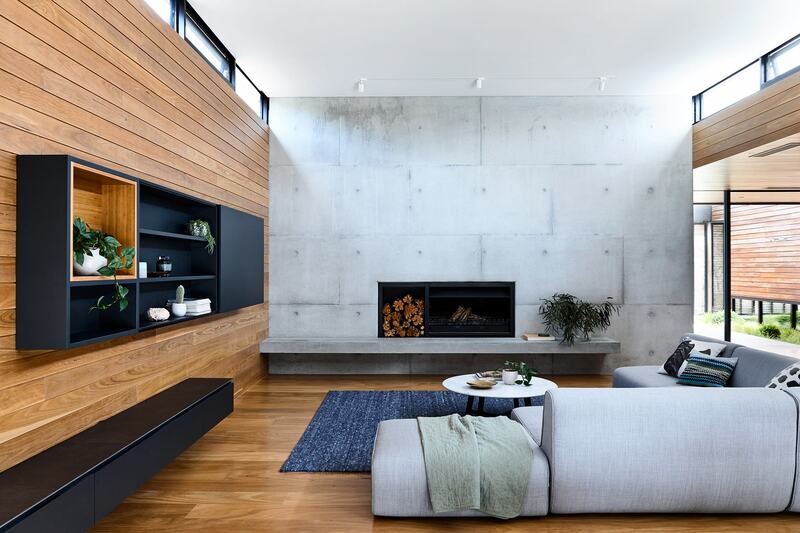 Connections into the house and through to the outdoor spaces are accentuated by continuous material links such as the blackbutt wall and ceiling linings, providing a warmth and softness to the interiors, offsetting the bold concrete elements. This consistency of material is continued throughout the house, with clear finishes used on all the blackbutt surfaces to exhibit the natural character of the material. Structurally, timber was used extensively, with LVL and glulam in particular used for their efficiency and structural flexibilities. 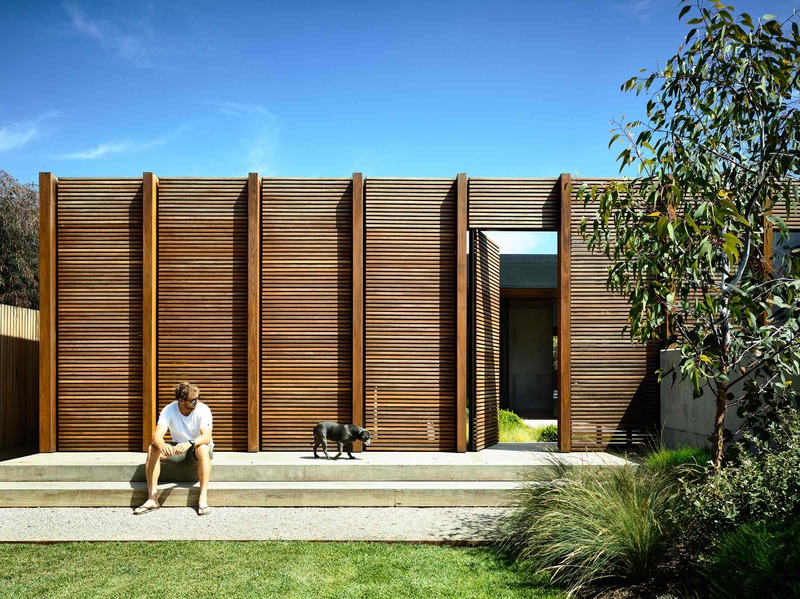 Cladding: Solid timber profiles and solid timber battens in blackbutt. 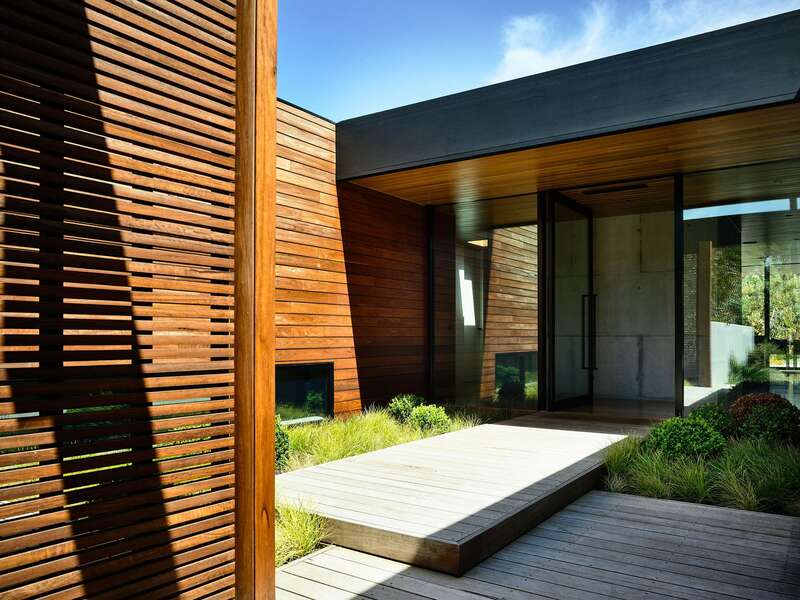 Timber was used for the relaxed feeling it can give to a building, for it's ability to settle into the surrounding landscape and natural environment in a seamless manner and for the visual warmth it adds to the building. Vertical Support or Wall System: Glulam vertical supports support the screening elements, and are clad in solid blackbutt. LVL and plywood formwork for in-situ concrete walls. Roof System: Structural beams used were a combination of solid timber, glulam and LVL and minimal steel. Pine trusses and cypress glulam. Floor Covering: Engineered timber flooring in all spaces except carpeted bedrooms and tiled bathrooms. Blackbutt from Big River Timber was used, finished with Loba. Interior Panelling: Timber veneers used on study. 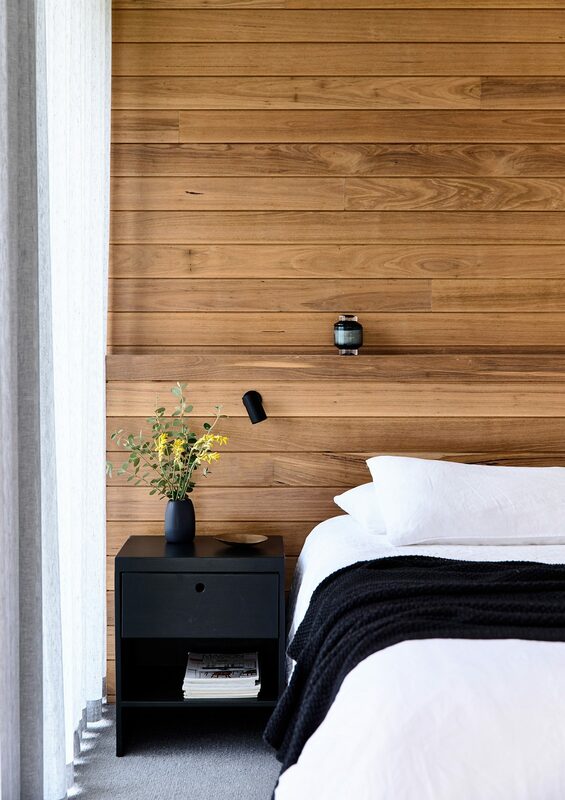 Shiplap cladding was used in the master bedroom and living room. Timber ceiling lining was used in the kitchen, hallways and living room. Blackbutt veneer and blackbutt shiplap cladding were used throughout the interior. Pergola: Exposed glulam beams used for pergola in outdoor living area. The beams and exposed structural fascias were external grade glulam beams. CONDEV Reception Space, the ATDA 2016 Standalone Structure Winner, features a complex screen wall unfurling from the ceiling and providing intimacy to the building’s reception area. 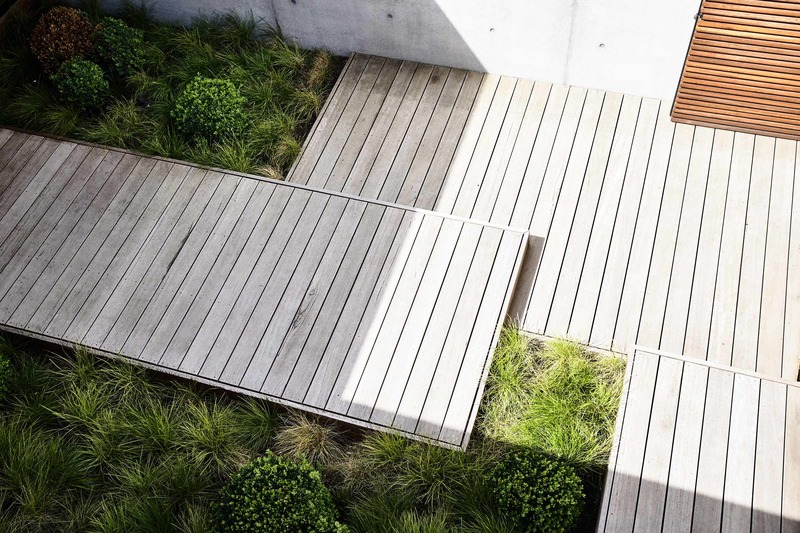 The Residential Care Home in Graz, Austria, creates a bright, natural atmosphere through extensive wood construction.